You can check out several promo videos and our four radio broadcasts on Pure Radio, Jacksonville, FL, FM 103.7 on YouTube! Just enter One God, Two Voices. April 12-14, 2018 – Midwest GREAT HOMESCHOOL CONVENTION, Cincinnati, OH – see below. May 5, 2018 – St. Andrews UMC Spring Vendor & Craft Fair, St. Albans, WV, 10:00-3:00. July 6-8, 2018 – Wild & Wonderful Festival, Cottageville, WV. August 24-26, 2018 – Appalachian Arts & Crafts Fair, Beckley, WV. April 12-14, 2018 – Midwest GREAT HOMESCHOOL CONVENTION, Cincinnati, OH. Another opportunity to connect with homeschool parents, sign books, and present workshops. ONE GOD, Two Voices Broadcasts, from Pure Radio, FM 103.7, Jacksonville, FL, are now available for your listening pleasure on YouTube. Google YouTube and enter One God, Two Voices; then choose Pure Radio selection. Please join us and enjoy! Share with your friends. I so enjoyed reconnecting with several people from “my Hampton Roads past” on Saturday, July 16, 2016, at the Christmas in July sale at Parkview Church of God. Kim Garner-Boone and I at the sale. This lady has made great strides in her life and worked at Jones Magnet Middle School with me. Former student, April Howard, and her handsome son, Mike, came to see me too. Always a blessing to reconnect with former students. The Potter’s House International Ministries, Jacksonville, Florida. 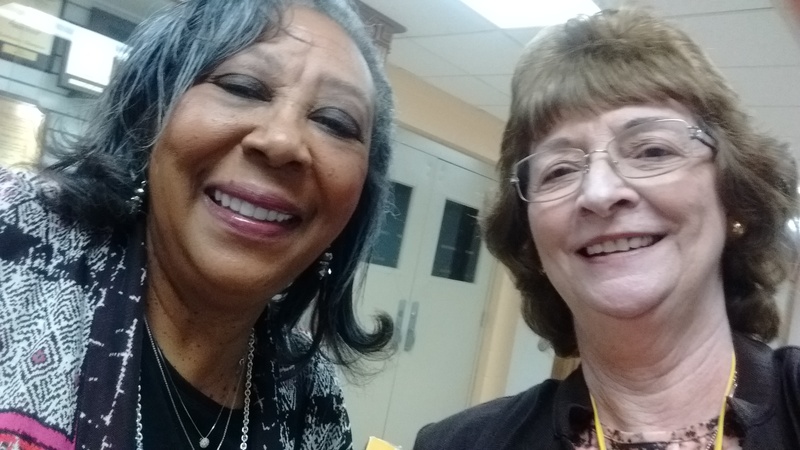 Sue – Voice II – enjoyed bringing the book to the ACSI Early Childhood Education Convention in Chesapeake, VA, in Feb., 2016 , where I was able to meet and visit with two special people. One, author & teacher/administrator, Doris Dancy (and her husband), and the other, former student and FB friend, Terri Mallonee Raney who brought along her daughter! It was such a blessing to visit with both of these special people. Left: Doris H. Dancy, author of Jagged Edges and Shattered Pieces. Right: Terri M. Raney, special former student and new reader of One God, Two Voices. May 6, 2016 – Thank you Family Christian bookstore, Lakeview Plaza, for allowing us to meet your customers at our book signing. May 8 – The Voices really enjoyed sharing with the WMU at Fairlawn Baptist Church, Parkersburg, WV. 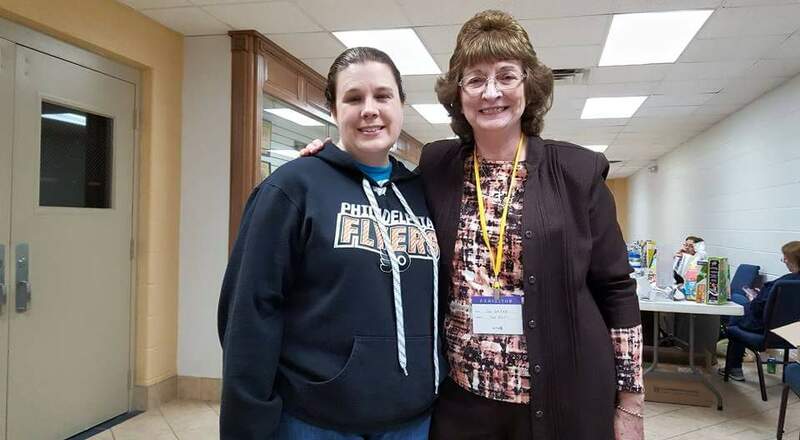 A “shout-out” to Jan – our most faithful customer who got to meet Deidre at our Fairlawn Baptist WMU appearance! May 10, 2016 – Thank you Parkersburg & Wood County Library for your hospitality. May 13-14 – The Two Voices had a great time at the CHAP Home School Convention in Harrisburg, PA.